Mensusa https://www.mensusa.com/articles/long-overcoat-men-the-perfect-choice-to-stay-comfortable.html Long Overcoat Men- The Perfect Choice To Stay Comfortable When the weather is cold and you need to wrap yourself in the warm overcoats, the ideal outfit that will keep you warm and snug is the long overcoat men. Most individuals need to work outdoors, whatever the season may be and in such situations there is no other alternative to long overcoat men. Every individual wants to create a good position for himself in the society. It does not always matter whether you are rich or not. The attire that you wear and your sense of dressing up actually portrays your personality. Hence it is really important to choose the right accessories that will enhance your looks and at the same time keep you warm during the winter season. The long overcoat men is the first pick of dignified men for many years. Various designs and styles have set in, but the importance and the popularity of this long overcoat for men has remained the same. There are various types of long overcoats that have different types of functions to perform. However, the basic utility is to keep you covered completely to protect you from all harsh weather conditions. Often a long overcoat men is worn over a suit for added warmth. The overcoats made from fleece are great for outdoor activities and camping trips. The cashmere or the blended woolen long overcoats add grace to your overall appearance on all occasions and wherever you go and even to your workplace. You will get different types of overcoats called topcoat, greatcoat and others. 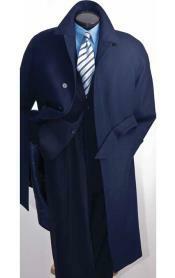 The long overcoat men is the typical long coat with full sleeves and is worn on top of an outfit. The best quality long overcoat men is versatile in all respects. It keeps you warm, fits you well and creates an attractive appearance. Various fabrics like 100% wool, cashmere and blends of cashmere and wool are used to make these coats. Pure wool is usually heavier as compared to cashmere long overcoat men, but is more durable. The sleeves are as long as the suit-sleeves and the shirt sleeves so that you do not feel cold at all. The gloves do the rest of the job. The length of these overcoats go down to the ankles although some men may customize them according to the requirements and structure. The fits should be calculated only after wearing the shirt and the suit on top of which you will wear the long overcoat men. It must be just right to make you feel comfortable and look smart as well. About the designs of the overcoat, it depends completely on your choice and what makes you look good. You can opt for the single-breasted long overcoat with notched lapels or the double-breasted overcoat with peak lapels accordingly. Other classic designer long overcoat men are the chesterfield coat, covert coat, trench coat, Paletot coat, the guard's coat, ulster coat, polo coat and others. These timeless and extremely useful long overcoat men are the must-have outfit for all stylish men.